Time to get your plant on! This is my second year with having a small garden in my city backyard. It’s a smaller box-style garden about 5 feet by 12 feet long. Last year I was able to get some zucchini, sweet peas, basil and a few oddly shaped carrots out of it, but I did grow tomatoes in it, that the dog Comet ate before I got to them. I do dream that someday I can have a big garden once I get a place out in the country. When I do get my big garden someday I plan on planting corn and also green beans. I think it would be awesome to have enough of both of those to can for the winter. 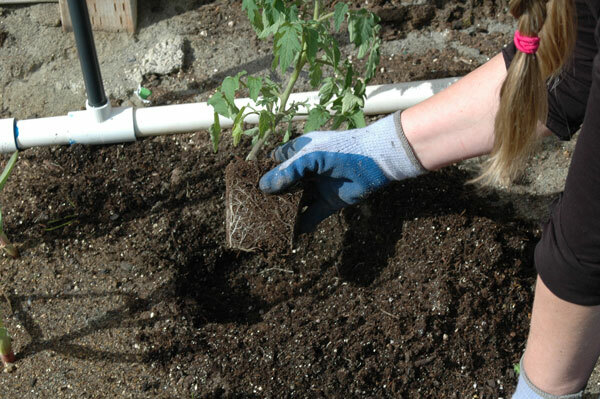 The first step to planting a garden is to prepare you soil. You can read how I prepared my first box garden and soil here. 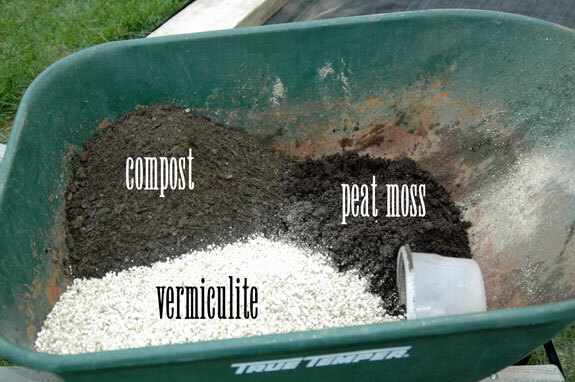 My own garden is filled with that perfect mix which is 1/3 Compost , 1/3 Vermiculite, and 1/3 Peat Moss. My veggies grew very nice last year with this mix. 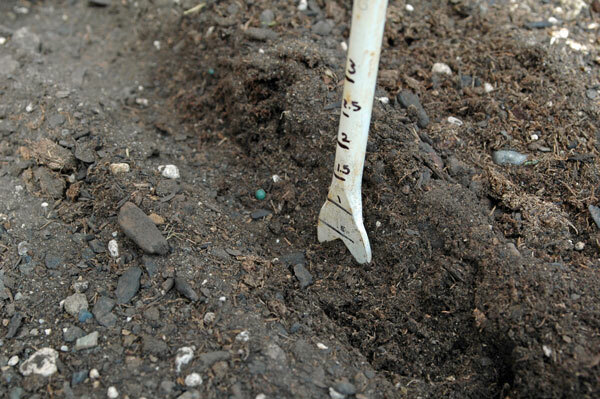 But you can also just rototiller a piece of ground, adding in some good compost too if you already have quality soil. Your next step is to write down a list of all the things you want to grow. I thought of things that my family WILL eat and produce I buy often from the stores. I won’t grow things our family doesn’t eat as it will go to waste. Carrots – last year my sq. foot garden was not deep enough so my carrots were fat, short and mostly “L” shaped since they couldn’t grow down any further. This year I will plant some in sand by my flowerbeds somewhere. I went online and Googled a companion planting form – this one was great here. When you are choosing where to place your veggies it’s nice to know some plants grow really well together and help each other out. Last fall I planted my garlic and it’s growing very nicely right now. 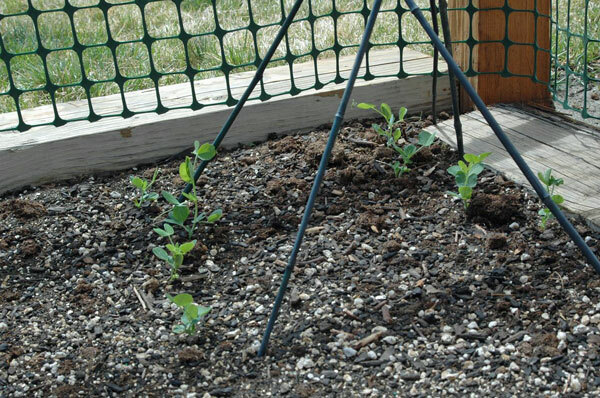 Then early this spring (like 3 weeks ago) I planted my sweet pea sees. They are coming up too. I went and used a garden nursery voucher I purchased from a daily deal site last week too. I purchased 3 tomato plant starts, some cilantro, oregano, thyme, and parsley to transplant. This will be my first time growing some of these herbs, can’t wait to make stuff with them. 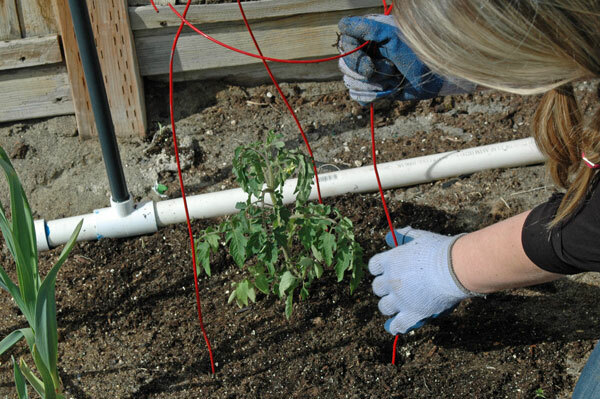 I transplanted the tomatoes, then added the tomato cages over them. Notice my garlic, it’s getting big! 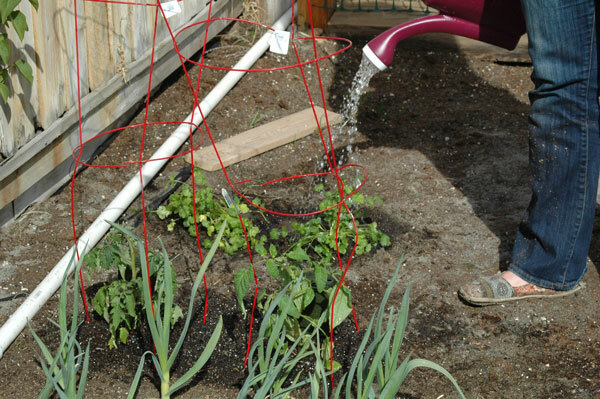 Did you know tomatoes and garlic grow nicely together? They do, they really do. 🙂 I am learning all kinds of cool things by gardening. I transplanted the 2 cilantro plants and watered them. Then transplanted the oregano, parsley and thyme plants. After all the transplanting, I decided I needed a break. So I went and said hello to Ginger the chicken. Note: I was not kissing her, ..I am actually closing my mouth so she doesn’t peck in my mouth. If I do kiss them it’s on the tip top of their feathery little heads, no where near their mouths…these ladies peck some gross stuff with their beaks. 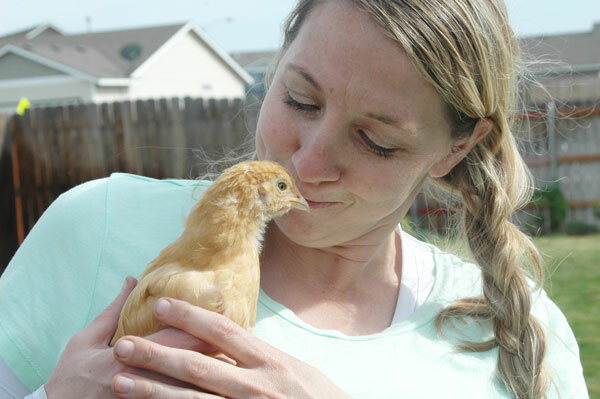 Sometimes I tell Ginger that she is cooler than all the other chickens in the world. I think she likes that. Then back to work. Time to plant some more seeds in the garden. 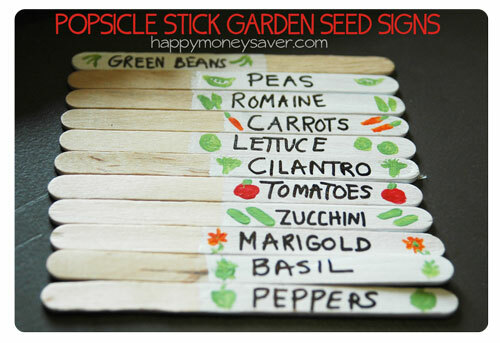 I grabbed the packs of seeds, a wooden board, my measuring garden stake, a straw and got to work. To make straight rows of seeds I like to use a random piece of wood (leftover from one of my husbands projects) or I have also used an old book. Just put it in the ground where you want your row and slide it back and forth. 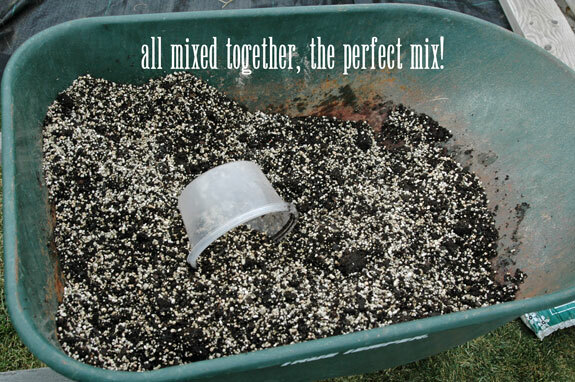 It will make a nice line for you to add your seeds in. Make your rows according to the package directions. If your seeds don’t have great directions, just Google them. 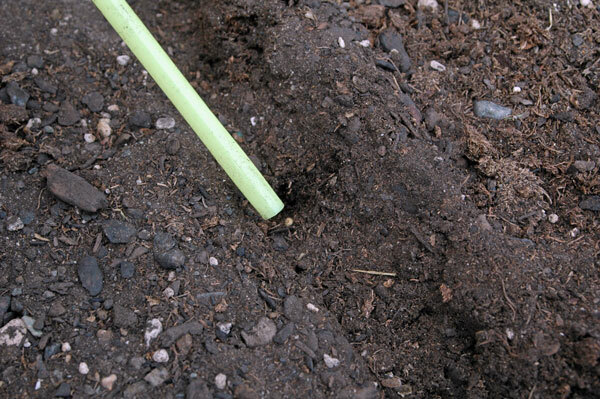 Some will say to plant 1/2 inch deep and others barely into the soil. 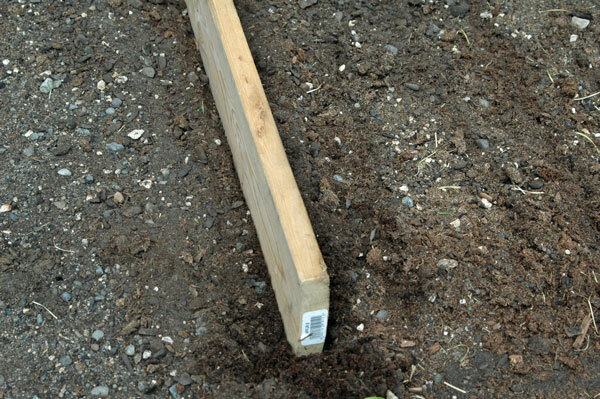 I measured on my gardening stake tool to tell me the depth I need to plant. I just took a regular garden stake tool and marked the inches on it with a permanent marker. Checking the depth carefully I added the seeds into rows. 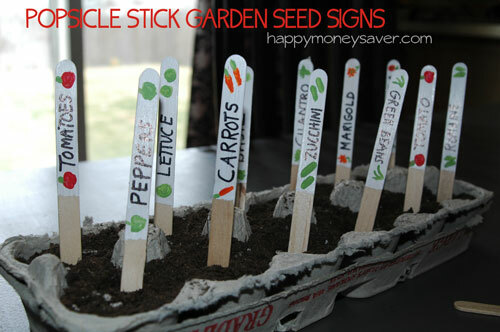 After planting I added in some of my homemade popsicle garden planting sticks – these things are just SO cute! They just make me happy when I look at them. And lastly I watered like crazy! It feels so good to get most of my planting done. I only planted one section of my green beans, and in a few weeks will plant another section of them so I have some beans to harvest through summer. I still have to plant my indoor plant seeds – like basil, celery, marigolds, my one tomato plant, zucchini and pumpkin seeds, but I will post about that later this week. I also am going to try and plant red potatoes in a garbage can – should be a fun experiment! I love seeing all the lovely green color in my garden – and can’t wait for summer to enjoy the many veggies and herbs too. 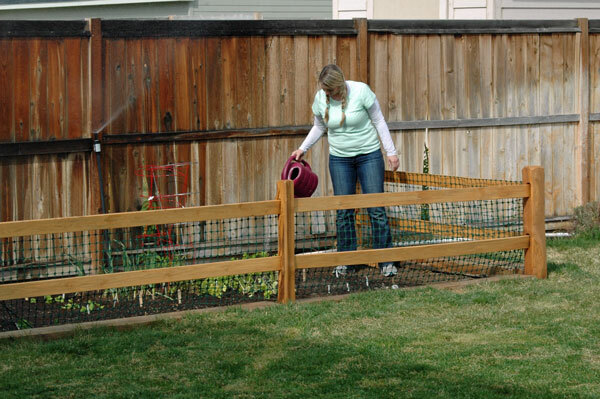 Are you doing a garden this year ? 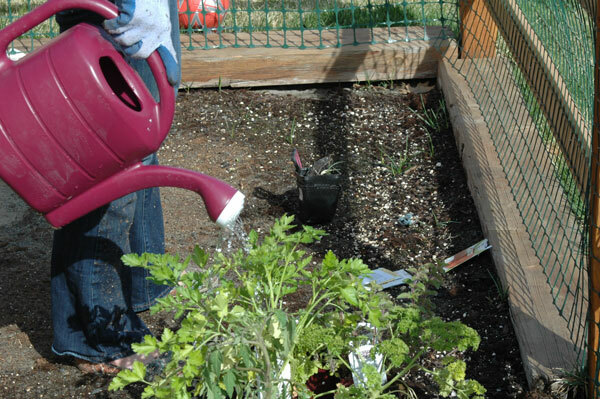 Have you done your planting yet? 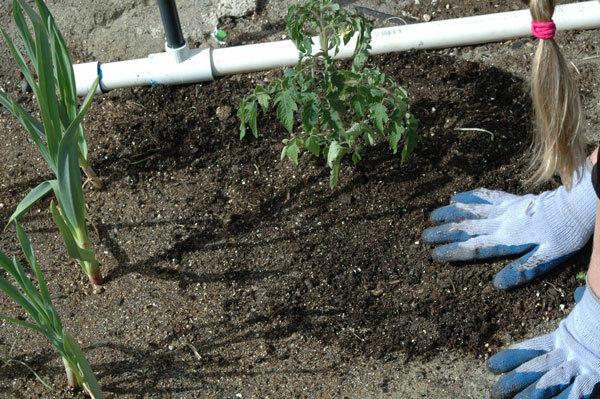 What has your time or weather allowed you to plant so far? I will probably fill in around the garden with marigolds if I can…I think I have some bare patches. I also think I am going to not put my potatoes in the sq. 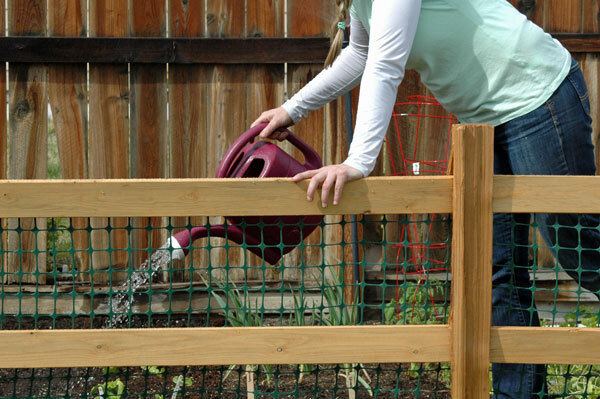 ft garden and instead do the garbage can method. 🙂 Hoping it turns out great! hi Karrie! 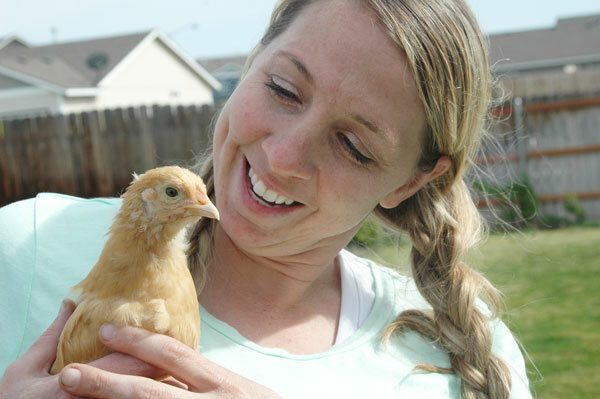 i always enjoy to read your post about your garden and lovely chickens!! (and i’m so sorry that you lost couple? of them…that made me sad too.) as you know, working on the garden is really hard but fun and a lot to learn from the great nature! i have planted potatos, tomatos, peas, beans, bitter melon, radishes, leeks, green onions, herbs, peppers, onions, garlic, zucchinis, spinach, japanese eggplant, okura, strawberry, white pumpkin, watermelon, cucumbers and marigold (for protect plants from some bugs as you said!) in my garden beds. i’m so glad that you’re already enjoying the gardening! hope we both will have a GREAT harvest in this summer!!!!!! Thank you Yoko! I have never heard of bitter melon. I hope you have a wonderful garden this year too and a huge harvest! 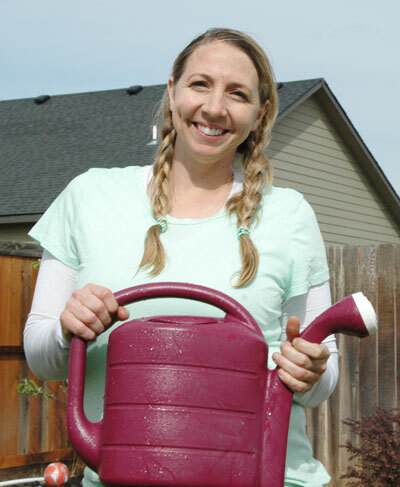 I tried square foot gardening and had the same issue with root vegetables. So I cut through the paper and tilled into the ground and had much better results last year. I amend the soil every year and rotate the crops. I invested in non-GEO (genetically engineered) heirloom seeds which are said to be healthier and the seeds can be harvested for use next year. I have success with peppers, tomatoes, any type of squash, carrots, onions, eggplant, peas, green beans, pumpkins, strawberries, raspberries, lemon cucumbers, and a variety of spices. I plant giant sunflowers that feed the ducks in the fall. A nice surprise was the artichoke plant I planted last year that came back this spring. I use organic pesticides and plant marigolds around my garden to encourage bees and discourage pests. It’s very satisfying to sit out in the garden on a nice spring or summer day and listen to the bees fast at work. Oh thanks, it’s whomever is around at the time taking my pictures. The ones on the porch were taken by my 6 year old son…the majority of them he cut off my head completely and I got lucky on one or two..LOL! What is a 5-in-1 pear tree? A bunch of different kinds of pears in one tree? That sounds cool. I wish I had more room to grow corn now, mmmm….fresh corn on the cob would be delish.